Bowling Rewards offers a unique type of membership that helps you unlock exclusive benefits and extraordinary value at participating merchants, all without common restrictions, blackout dates/times, minimum purchase requirements, confusing points or paper coupons. And using your Bowling Rewards membership is easy and rewarding. Because your mobile phone number serves as your account number, you can use either a plastic card OR your mobile phone number at check out to redeem membership value and earn cash back rewards at participating merchants. Simply present either your card or mobile number each time you spend money at a participating merchant to earn cash back rewards that can be redeemed toward a future purchase. Let the clerk or server know when you want to redeem your balances and apply that value toward the bill. Your loyalty account is capable of holding three separate balances of goodies. Here is what they mean. The Gift Balance: The Gift Balance is charged up with value when you buy a gift card from a merchant or load your account with value in advance based on a gift promotion. Gift value can be redeemed immediately by patrons and works exactly like any gift card you’ve ever used in the past. The Reward Balance: The Reward Balance accumulates for lots of different reasons, including receiving a cash bonus for activating your account or just because it’s your birthday, anniversary or even St. Patrick’s Day. You also receive rewards when you present your card or mobile number at check out based on a percentage of the sales ticket. We know you’ve already got enough to keep track of, so rewards are always issued in straightforward cash currency (i.e., $10.00) rather than confusing points. But rewards can only be redeemed after you activate your membership, so if you haven’t yet done so, please do it now. There’s likely free money sitting in your account just waiting to be redeemed. The Games Balance: The Games Balance shows how many free games of bowlin g are available in your loyalty account you can redeem at the front desk. 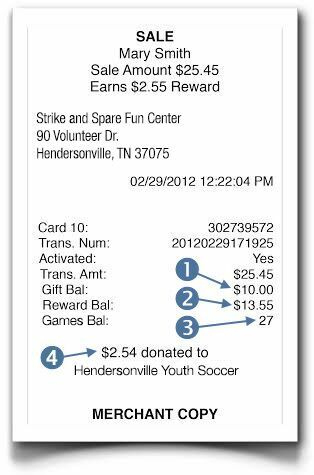 Similar to rewards, games can also accumulate for all kinds of reasons such as birthdays, holidays (e.g., New Year’s Day, Cinco de Mayo), or maybe because you were among a center’s top sp ending visitors last month. When buying an optional premium membership, your account mig ht be funded with dozens, even hundreds of games with a redemption limit of 1 or 2 allowed per day. Fundraising: Did you notice the footer message on this printed receipt? It shows this patron account is affiliated with a local fundraising organization. 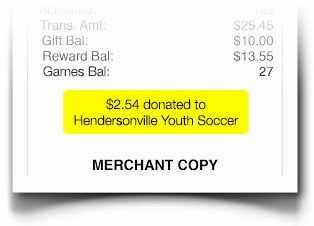 This means that every time this customer spends money at a participating merchant, a percentage of the sale donated back to a local organization of your choice. You don’t need a printed receipt to find your balances. You can login to your account anytime to check your balances. In many cases, you’ll also receive a thank you email the day after a visit reporting current balances available for redemption. Don’t Forget To Support Local Causes With Fundraising! Did you notice the footer message on this printed receipt? It shows that your account is affiliated with a local fundraising organization. This means that every time you spend money at a participating merchant, a percentage of the sale donated back to a local organization of your choice by that merchant. Donation rates average between 5 percent and 10 percent of the sales ticket, so it’s nothing to sneeze at. You can link your loyalty account with an available fundraiser during the registration process or when signing into your account online. If you don’t see your favorite local cause in the drop down list, then ask the participating merchant to add your cause to the list so both you and others can select it and support your community with every purchase.